The perfect setting for a memorable family reunion, get away with friends, birthday and anniversary celebration, corporate retreat, artisan adventures, and unforgetable, intimate weddings. Weekly rentals are preferred, however call owner for other options. Owner is allowed one rental/week as per Monterey County Use Permit #286. This private, historical estate encompasses 14 walkable acres in the heart of the Arroyo Seco Highlands looking out over the Arroyo Seco River Canyon and the Ventana Wilderness. Once the site of an early California health retreat and a stage stop the Estate sets the stage for an unforgetable get away. The entire property has been lovingly restored recently; including gourmet country kitchen, lush ornamental gardens, 55' pool and large open social areas, with several updated outdoor BBQ areas. Located on a mesa above the Arroyo Seco River with magnificent views in every direction of the surrounding mountain wilderness. Guests are welcome to collect fresh eggs daily from our chickens. and harvest from the seasonal organic vegetable garden and numberous fruit trees. Kids will lovevbrunniing free on the large expanses of lawns, swinging on the swings and watching the wildlife at every turn. The front acreage is devoted to the organic vineyard, producing award winning wines, including Syrah, Zinfandel and Sangiovese and Grenache. A trout pond adds nutrients for our sustainable organic farming practices and fascinating wildlife viewing from the dock. Our wines are available for tasting and sales. Huge ancient oak stands among vast lawns and ornamental gardens will remind you of the history within these golden hills, quintessentially Californian. Teddy Roosevelt once stayed here, we're hoping you will too! Available all year. Every season has it's beauty. Ask about Winter Rates. Owner is allowed one rental/week as per Monterey County Transient Use Permit #286. Owners and staff available to help plan the event of a lifetime. Catering available. Vineyard and winery owner. Two daughters, both married with babies. It's the most beautiful land I've ever encountered. I feel fortunate to be it's steward. 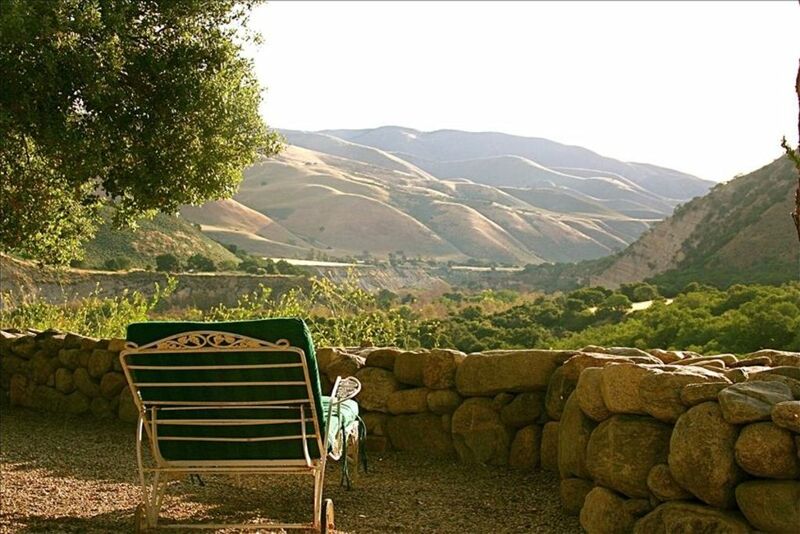 Expansive views of the back side o Big Sur, with mountains up to 5,300' in view. outfitted with cable for Ipod's etc..
incredible birding, stargazing, beautiful vegetable and ornamental gardens, awe-inspiring mountain and river vistas. Kids of all ages are find something to do here.....swings, chickens and trout to feed. Take your family and friends to a place where it's all right here. This is one of those VRBO gems that you just never want to leave - ever. The pictures simply do not do this place justice. We celebrated my husbands 51st birthday with a crew of our closest friends and felt like we had been transported to the hills of Tuscany. The whole place has a peacefulness about it that is hard to describe -- it must be felt. The views, the charming home and quiet spaces, the vineyards and stone fencing meandering through the property. Totally magical. Looking to cure yourself of all the city ills? Walk a few minutes and plop yourself down under a tree to gaze out over the valley, listen to the buzzing of happy insects and birds and watch the sunrise with a hot cup of coffee. Also, as a family that considers ourselves serious weekend warriors, we have rented many places all over Northern CA. It's such a pleasure when you interact with an owner that is helpful, easy going, accommodating and truly wants you to enjoy yourself. Ann made us feel very welcomed and cared for. How nice not to have to stress the small stuff! Thanks, Ann. Mesa Del Sol is heaven on earth! Great host, great location, great experience! We were a large group of young folks looking to celebrate my birthday with a weekend getaway. Our expectations were exceeded by the beauty of Ann’s home. Moreover Ann took every measure to ensure our stay goes perfectly. I wholeheartedly recommend making this trip! My party of 31 loved Mesa del Sol. The setting was beautiful and private. We thoroughly enjoyed hot-tubbing while looking out over the Arroyo Seco canyon. Ann came to the property on our second day and gave us a tour/wine tasting, which was a highlight. In general, she was a breeze to work with, and I wouldn't hesitate to book again. Mesa del Sol was better than expected. The scenery is spectacular, and the estate well-appointed, comfortable and charming. Ann was accommodating and easy to work with, and the care taker was also very helpful. Our large group felt that we had the support that we needed, but our privacy was also respected. I would not hesitate to stay here again! Thanks for everything, Ann! The view, the land, the vineyard, the quarters, the space - it all added up to a perfect location for a family reunion. Great gathering spaces plus plenty of room for a bit of alone time when needed. Comfortable, well furnished, everything we needed for cooking, dining, relaxing and recreating. The owner Ann was a delight to work with - quick to answer questions and always pleasant. We had no issues to deal with during our stay, but I am confident that she would have been right on it if something had come up. Very professional and organized, and also very personable. It is always a bit stressful to select the location for a big family gathering - this is one selection that you won't have to think twice about. Great choice, and a great experience. Thank you! You and your family were the perfect guests! listing states that the house has all the modern conveniences, and I foolishly assumed that would include air conditioning, lesson learned, I was forecast to be around 100 degrees for the high for our stay, buyer / renter beware ! Hmmmmm. The house was built in 1936 by a state senator and is well insulated. Night time temps were in the 50's and if you open the windows at night the cool air comes in and cools the house beautifully. The renter decided to cancel his stay for his wife and child and nanny at 11pm the night before. I was there during the days of his stay and it was very nice. The trees, the winds and the dry air makes for a nice stay. Sorry he didn't visit. 5 miles up Arroyo Seco Rd. is the Arroyo Seco Recreation Area with off road hiking and biking and lots of water fun. Wine Tasting opportunities near by abound (along with private wine tasting and vineyard tours at Mesa Del Sol).